Oysters are a prized delicacy, mostly enjoyed raw on the half shell. There are several varieties from both the East and West Coast and their fresh, briny taste will remind you of the ocean. The somewhat cool, slimy texture, turns some people off. There are usually two distinct camps of people: those who are oyster lovers and those who will not go near them—there really doesn't seem to be any in between. If you fall into the first group, it is important to know how to select oysters and keep them fresh. Oysters are sold raw, frozen, and canned. When purchasing fresh oysters, there are a few things you want to look for, starting with buying from a reputable fish market or seafood section of your grocery store. All bivalves in the shell, which also includes clams and mussels, by law, must be sold live. Live oysters will be tightly clamped shut or will clamp shut when tapped. Dead oysters will have loose shells and must be discarded along with those that have broken shells. Fresh, live oysters should feel heavy and full of water. Canned oysters, which are either plain or smoked, have been removed from their shells. Shelled oysters must be pasteurized and canned or frozen before sale. Canned oysters suffer a loss in flavor from the time they were fresh and are usually used only in cooked dishes. Smoked, canned oysters are great for appetizers. When you bring raw oysters home, store them in their shell, large shell-side down, in the refrigerator (no lower than 33 F) for up to five days (although the flavor is best when they are consumed within 24 hours of purchase). They should be packed in either a mesh bag or in an open container covered with a damp cloth. Do not seal live oysters in an airtight container—they will not be able to breathe and will die. You can refrigerate freshly-shelled oysters in their own liquor (the liquid they sit in) for two days, but use them as quickly as you can. You can freeze shucked oysters but never freeze oysters in their shell. Frozen raw shucked oysters will keep for up to three months. They should be thawed in the refrigerator and then used as you would fresh oysters for cooking. 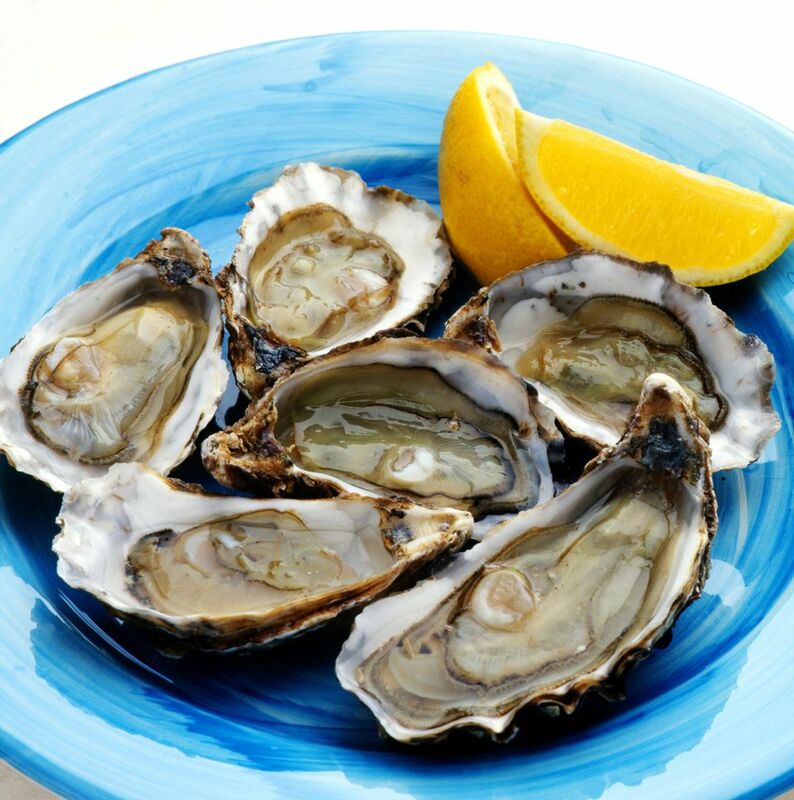 Cooked oysters can be refrigerated but should not be frozen. Upon freezing, it hardens. Upon thawing, it becomes rubbery and tough to chew. Use leftover refrigerated cooked oysters within three days. Canned oysters will have an expiration date and should be refrigerated in their liquor in a covered container once opened. Most commercially-available oysters these days have fairly clean shells. However, if you need to clean them, scrub the beards and dirt from the shells while holding them under cold running water before opening them. The beards appear like brownish threads hanging between the two shells. They are edible, but the gritty texture is not particularly pleasing. Pinch the beard between your thumb and first finger. Use a side-to-side motion and firmly tug the beard out. If you do not notice a beard, it was likely removed during processing, so it is OK if you do not see one. In order to open the oysters, which is called "shucking," you will need a special knife and pair of gloves. The gloves are not mandatory, but you will be thankful that you have them if the knife slips. When shucking oysters, take care to retain the flavorful liquor inside. The liquor should be clear, not cloudy, and should not have any sour or unfavorable odor.